Bulk SMS software is the need for today’s business. There are many businesses entering the market. However the competition makes them to fold their knees in front of the well-established businesses. If you want to step up with them to give them a hit, then bulk SMS software can do this on your behalf. Bulk SMS software can send a single SMS to about millions of people simultaneously in just a single click. You need not sit in front of a PC for long hours. The software will run automatically once clicked. And the charge is also one time. Once you owned the software then you just have to pay for the monthly server charges that are almost negligible if compared to the benefits. A Bulk SMS Reseller is one who owns bulk SMS software and makes them available to those who don’t need complete software. Simply selling a limited number of SMS further to people, he/she can earn a huge profit. The most attractive thing is that the whole profit will be of reseller. As the software brings in traffic, that means more the number of customers are, the more will be the chances of sale of products/services. It will lead the business towards a positive growth. Sending SMS one by one takes a lot of time; but the software saves this precious time by letting an individual to send SMS in bulk. The price per SMS is very less than the same service offered by most of the telecom companies. Makes the marketing campaign of your business easier. The software keeps tracks of how number of messages has been sent and to whom. A person can schedule the time means you can set the time if you want to send the SMS later. It will work automatically. The software has its own database where the numbers are stored. Bulk SMS software comes with an easy to understand script that is another plus point of it. Beware of the fake or fraud service providers to make your money worth. 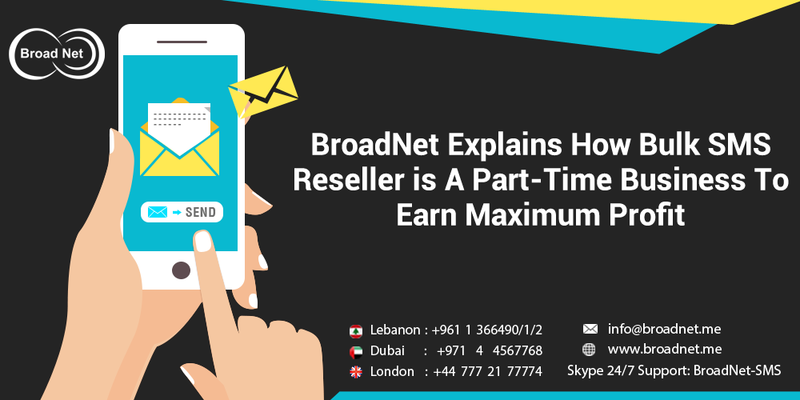 Only opt for the companies such as BroadNet, which has marked a record for the unequivocal success. However, the cost of the software may vary among different service providers. It solely depends upon number of SMS they provide. More the number of SMS and other features more will be the cost. So, confirm it before purchasing. You can easily purchase the software online. There are number of sites that avails the software. For example at BroadNet, simply by making payment through PayPal, Debit/Credit card, you can get the software in your hands. Becoming a bulk SMS reseller is worth because whatever you earn is completely yours. You don’t have to share the profit with someone and also you need not to give any input. So, if you want to choose it as a part time business then go ahead and make money.